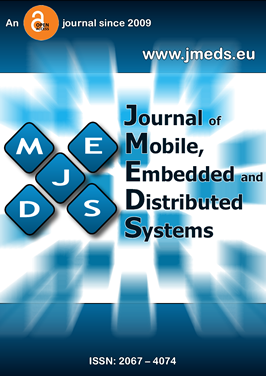 The Journal of Mobile, Embedded and Distributed Systems (JMEDS) is an open accesspeer reviewed and indexed international journal that publishes the latest results of researches and developed solutions in the field of mobile, embedded and distributed systems. JMEDS aims to attract young researchers and to provide them a way to publish their work. Young researchers that are in the final year or have finished their PhD or MSc program in 2008, 2009, 2010 or 2011, are invited to send a paper that describes personal contributions to any of the journal topics. JMEDS is an open journal that provides immediate open access to its content on the principle that making research freely available to the public supports a greater global exchange of knowledge. Researchers or developers interested in proposing a special issue are invited to contact the Journal Editor. Authors should submit original and high quality results that have not been published, nor are under evaluation process, in any other journals. Submissions should follow the guidelines of Journal of Mobile, Embedded and Distributed Systems, which can be found in the About section.